Matthew and Marion Peake, of East London, who are helping tens of thousands of desperate people as God once helped them. 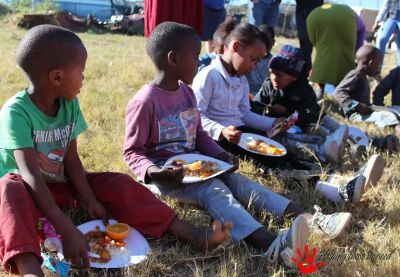 Last week Marion and Matthew Peake led a Mandela Day outreach in which they fed around 4 000 children and shared the Gospel in a poor and notoriously dangerous township area in East London. Children responded by laying down firearms and knives, and the day was marked by miracles, as has so often been the case in the 19 months since the couple began to help destitute and broken people, just as God had delivered them from a place of extreme desperation. “We want to help people who have no other way out than Jesus, because if He could do it for us, how much more could He do it for other people?” said Matthew, who estimated that they have fed and ministered to between 50 000 and 100 000 people since they started their “Helping Those in Need” campaign in January last year with no funds and just a Facebook page offering help to anybody in desperate straits. I interviewed Matthew during a recent visit to East London. Marion, who had undergone a double mastectomy the previous week and is now having chemotherapy for breast cancer, was not able to join us. The Peakes are fighting a tough faith battle for Marion’s health. She amazed hospital staff by how quickly she was back on her feet after major surgery and is not letting up in her inspirational caring ministry, for which she has been recognised as a finalist in a regional businesswoman of the year award campaign — on top of other accolades she has received for her service. Marion Peake at last week’s Mandela Day outreach which she took on with enthusiasm despite having recently started chemotherapy for breast cancer. Matthew told me they endured many years of a “living hell” as addictions, infidelities, poverty and more, brought them to point where they hated one another. They often found themselves in great need with no helping hand available — something that would later inspire them to reach out to desperate people. Things got so bad that they nearly killed each other with a knife and Matthew made several attempts to end his life. One day he cried out to God to show Himself if He was real. “And that’s exactly what He did,” said Matthew. He then ended up on his knees, giving his life to Jesus — and his life was changed forever. The next 18 months were a struggle as he and Marion, who battled to forgive him for the years of pain he had caused her, continued to fight frequently. He tried on his own to figure out what it meant to follow Jesus. He believes the Lord used the hard time to teach him lessons about being a husband and father to their two young daughters. He eventually started attending church and began a Bible college course. But one day, while visiting another church, he heard a message about “how much Papa God loves us as sons”. He wept as he realised he did not know Jesus that way but rather as someone to whom he had to make amends and prove his worth. Children enjoy meal at an outreach. Then he heard the Lord ask him why he was studying to be a pastor, as He had not called him to be one. Shaken, he gave up his Bible college course and then his life began to change. One day at the end of 2016, Marion, who despite her struggles had a longstanding relationship with Jesus, and who had often fed neighbourhood children — even when they were struggling financially — suggested that they should bless kids at a children’s home with Christmas gifts and party packs. God had also been growing compassion in Matthew’s heart and a burning desire to see people set free, so he readily agreed to his wife’s proposal. They committed to blessing a children’s home before they discovered there were 105 children there. Realising they would need help to buy so many gifts, Marion posted an appeal on Facebook. To their surprise people responded so generously that they ended up buying gifts and party packs for all the children at two homes. Marion Peake gets into the spirit at a school outreach. 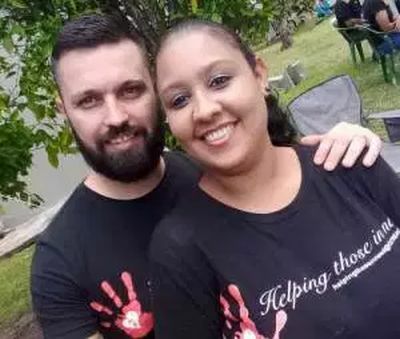 Marion and Matthew so enjoyed spending their Christmas day loving on children that they decided to start a Facebook page offering help to anyone in need. They only had R100 at the time but they believed people would assist as they had done with the children. They launched their “Helping Those in Need” Facebook page in January last year and within a week they were inundated with requests for assistance. The cries for help were so overwhelming that they considered closing their page. But one plea from a desperate family touched them deeply and Marion said they should buy food for them with their last R100. Marion cooked a meal which they took together to the family’s home, praying for them before leaving. Understanding that their ministry was to take the Gospel and hope in Christ to desperate people — and that meals were a tool to get into people’s homes — they kept on responding to pleas for help. But after several weeks they were struggling to make ends meet and did not have the resources they needed to feed people. But then God started to open doors and various stores began to donate food to their mission, providing enough to feed about 20 families of five who they were helping at the time. They often went out at night to counsel and pray with people struggling with difficulties. During these times they saw Jesus heal people of physical problems, deliver people from addictions, restore broken relationships and experience love for the first time. They started doing street evangelism and community outreaches, often partnering with local businesses and churches. They now have ministry branches in Queenstown, King William’s Town and Berlin. They recently started holding Gospel crusades and despite ongoing financial struggles and Marion’s cancer, they have a dream of establishing a shelter to house and disciple people who have nowhere to go, and to provide them with daycare, school and skills training facilities. 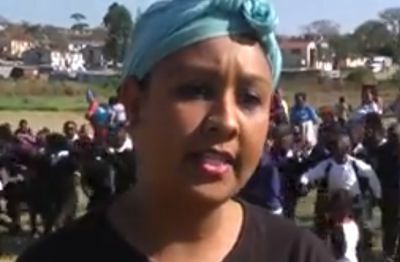 Last week’s Mandela Day event at “Durban Flats”, in partnership with various businesses and ministries, was their biggest community outreach to date. They had expected to feed about one to two thousand children but ended up feeding about 4 000. 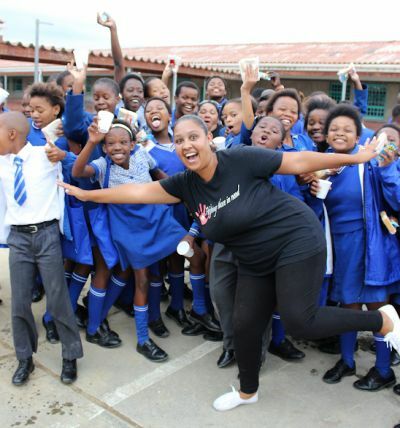 Their sound equipment, which was critical to their mission, failed but then a company truck arrived out of the blue as the driver and crew were attracted by the outreach activity on the township field. The truck happened to be carrying sound equipment which they used during the outreach. I have known the Peake’s for a long time, and I must honestly say that they both truly blessed behond words. They have helped and blessed so many families to date. Marion is a very dear friend of mine, and she is the strongest woman I have know. With her own personal difficulty and battle that she fights, she is still at peace with it and she is still their for everyone else. Wow! Thank you. your story and testimony spur us on. May God bless you in all you do.